“Are you under the impression this isn’t your life? Do you dabble in depression? Is someone twisting a knife in your back? The last time I saw Jeff Tweedy, he was giving a solo show in Burlington, Vermont. This was a few months ago. I crossed many states just to be there, and watch him perform, sans band, and cherry pick songs from his vast back catalog of my favorite music. He unveiled new songs like “Solitaire” and “Everlasting Everything,” and played a reconstituted “Spiders,” during which the audience of a few hundred sang in unison, “It’s good to be alone.” It was an amazing show, and well worth the drive. I last interviewed Tweedy in 2004 for this magazine, when the Chicago-native had just gotten out of rehab to treat his addiction to pain killers and manage his panic disorder. The band was readying the release of A Ghost is Born, their ambitious follow-up to the career-defining Yankee Hotel Foxtrot. The road that lead them to Ghost was fraught with internal struggles and external victories—in 1995, Tweedy launched Wilco after an acrimonious split with Uncle Tupelo co-captain Jay Farrar, who went on to found Son Volt. Their first album, A.M., sold poorly in the shadow of Son Volt’s Trace, but was a solid debut, featuring alt.-country gem after alt.-country gem. The 1996 double album Being There increased their critical standing and remains a major work in rock and roll, a “Catcher in the Rye” for music lovers. Tweedy’s musical partner at this time was band multi-instrumentalist Jay Bennett, who helped Tweedy realize the pop-tastic visions of 1999’s Summerteeth and reach the avant-garde heights of 2001’s Yankee Hotel Foxtrot. But like all early Wilco members save bassist John Stirratt, Bennett (who sadly passes away this May) and the band eventually parted ways. His strained exit was captured in I Am Trying to Break Your Heart, which also documents the band’s struggle with their record company, Reprise, over Foxtrot’s commercial value—they would eventually leave the label for Nonesuch after Reprise squashed its release. The story of Wilco 2.0 has been a fruitful one. The Ghost is Born tour introduced the world at large to new member Nels Cline, a guitar hero’s guitar hero. Their incendiary concerts were immortalized on the live album Kicking Television, and the band’s new musical rapport (from adding members Pat Sansone and Mikael Jorgensen to the lineup, which since 2001 has included the imaginative drum work of Glenn Kotche) was the highlight of last year’s Sky Blue Sky. Their new DVD, Ashes of American Flags, shows the band on the road, icing up, achieving lift off, and viewing the disappearance of small town America through their tour bus windows. 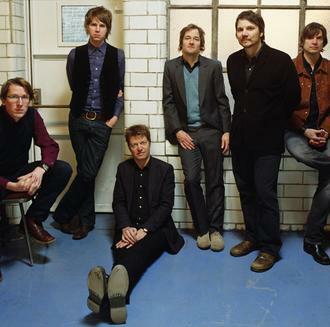 In June, they released their seventh LP, Wilco (The Album), the first record to feature the same lineup as the album before. With meditations on marriage and commitment (“One Wing,” “I’ll Fight”) a duet with Canadian singer/songwriter Feist (“You and I”) and some excellent rockers (“Bull Black Nova,” “Sonny Feeling”), it’s another great record from a band who seems incapable of making a bad one. When did you write the songs for this album? Over the last year or so, since the last one come out. As opposed to the songs on the last record, which had been accumulating over the years, this one there’s really nothing that’s any older than Sky Blue Sky. I don’t think any of these songs were even around when we were recording Sky Blue Sky, so it’s a fresher batch.